This is because young people, who carry smartphones, are now part of the processions. The Kanwar Yatra, which concluded on Friday, has now become a social media event, as participants make videos of the procession and post it on the Internet. From a religious event, where all the action is on the streets, it has become another occasion for selfies. This is also because young people are now seen as part of the procession. The yatra entails walking between 50 and 400 km. On the last day, lakhs of pilgrims were seen carrying water from the Ganges to their hometowns. After the Amarnath attack, extra vigil was deployed this year for protection of the 3 crore pilgrims. ‘Sawan’ season during July-August witnesses the annual procession of Kanwariyas ready for the Kanwar Yatra. Devotees of Lord Shiva collect water from the Ganges and bring it to their home towns or famous temples by balancing kanwars ~ water pots tied to a bamboo stick ~ on their shoulders. This holy water is to be poured over Shiva lingas. As legend says, during the ‘Samudra Manthan’ (churning of the ocean) Lord Shiva gulped down the poison that emerged in the process. This turned his throat blue and gave him the name Neelkanth. Previously sages, and now devotees of all ages, pour Ganga-jal over Shiva lingas to ease the burn from the poison. It was only in the 1980s that the Kanwar Yatra gained popularity among the masses. Pilgrimages began from places of religious importance like Haridwar, Rishikesh, Gaumukh and Gangotri. While traditionally the pilgrims walked barefoot, devotees nowadays often wear shoes. Dak Kanwars are seen travelling on bikes and other vehicles. It is a pious ritual among devotees of Shiva, but Kanwar Yatras have, in the recent past, caused law and order problems. Use of speakers and DJs has led to escalation of noise levels. Some processions play “vulgar” music that causes disharmony. There have also been fatal road accidents and stampede deaths among pilgrims. Traffic jams are common in areas through which the Kanwariyas pass. This year, the Kanwar Yatra began on 10 July. Extra measures were taken by Delhi Police. Routes were marked and it was made mandatory for devotees to carry valid ID cards. Careful surveillance was carried out to ensure safety of the pilgrims. Carrying tridents or sticks taller than 6 feet was prohibited. Kanwar camps were stationed at short distances throughout the city for regular supply of water, medicine, areas of rest and toilets to the pilgrims. For ease in travel and to avoid excess rush, the Railways gave orders to run three pairs of special trains between Delhi-Haridwar, Rishikesh-Haridwar and Bareilly-Haridwar from 10 to 21 July. According to records in Haridwar, about 50 lakh Kanwars participated in the procession in 2007. The number has now crossed 3 crore. A similar procession takes place in Tamil Nadu called Kavadi festival. 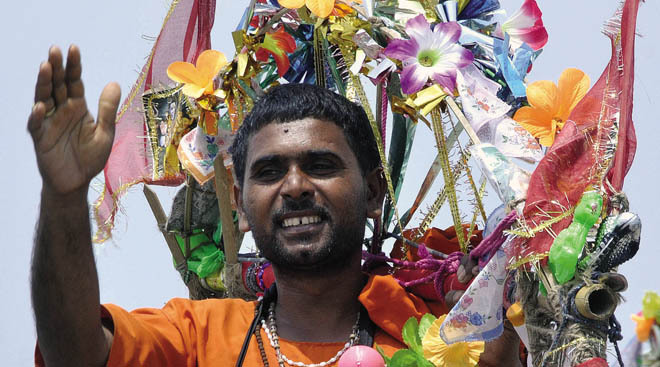 Devotees of Lord Muruga carry ‘kavadis’ filled with rice or milk. They walk in silence up the Palawi hills, bells attached to the ‘kavadis’ ringing loudly to announce the passing of a procession.